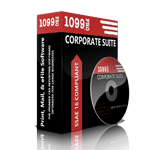 Corporate 1099 Software for 1099 Management and 1099 Reporting. Please fill out our short survey, or call (866) 444-3559, for a personalized demo and pricing information. 1099 Pro, Inc. Corporate Suite software is the ultimate tax filing solution for entities seeking to file large volumes of forms, form types, filing entities, and information requests. This 1099 management software is also uniquely tailored to the sophisticated needs of filing entities, which include: custom report management, CSR's with secure remote login, form aggregation, and specialized printing/filing formats. Corporate Suite combines the speed, performance, and security Microsoft's SQL Server® technology with 1099 Pro's state of the art software and the option to be in-house or hosted at 1099 Pro's SSAE 16 SOC 1 Type II secure facility. Please fill out our short survey for a personalized demo and more information! The all in one corporate 1099 software & 1099 management software for 1099, W-2, and 1042-S reporting. 1099 Pro offers industry leading support via phone, email, live chat, remote computer connection, and video walkthroughs. 1099 Pro's experts can assist with anything from installations, importing, network troubleshooting errors, data retrieval, printing/mailing, electronic filing, or simply finding out which software or service is best for you! Learn how to add a Filer in your 1099 Pro software. Learn how to add a form in your 1099 Pro software. Learn how to use the Quick-Print feature in your 1099 Pro software. Learn how to import your records using the standard template provided by 1099 Pro. Learn how to file your forms on paper using the 1096 or W-3. Learn how to electronically file your forms to the IRS/SSA through the Service Bureau. Bulk TIN Checking is an essential compliance and risk mitigation service that identifies TIN/Name mismatches prior to filing with the IRS. Penalties can be assessed at up to $100/record at the IRS’s discretion. 1099 Pro's secure SSAE 16 SOC I Type II Service Bureau can make your recipient forms available to view online instead of printing and mailing. The 1099 Pro Managed Services team, IRSCompliance, can maintain your payee and payment database in our secure environment, or on your secure servers. Managed Services can support current and prior years of tax data for forms 1098, 1099, 5498, W-2G, W-2, 1042-S, 3921, 3922, as well as Puerto Rico payment information. This service includes regulatory support and compliance training and year-end recipient statements. Simple and convenient for smaller volume filers! Enter or upload your information into eFileMyForms.com and we do the rest. Another great option to validate your TIN/Name combinations via individual checks or bulk! TINCheck.com is a straight-forward and user friendly resource; simply log in and instantly gain access to multiple verification sources in one place. The State of California Franchise Tax Board now requires business to withhold and report quarterly payments to any entity that is a non-resident of California. StateComply offers compliance at your fingertips! Enables printing to specified paper. Generates a file formatted to upload to the IRS/SSA. Securely upload files to 1099 Pro's secure web service for IRS/SSA filing. Number of filings included with software. Unlimited transactions available for purchase. Amounts may vary depending on system specifications. Review and convert electronic files to import into 1099 Pro software. Pre-loaded with both state and federal filing thresholds for optional filtering of records. Supports transactional imports and record aggregation. Ability to import fixed-width files. Automated imports and reports via scheduler service. Access data from your web browser. Includes "Lite" version for ultra-fast results. Allow recipients to view forms online through your company portal. Can 1099 Pro be installed on a network? Yes, you can purchase the 1099 Pro multi-user license which will allow you to install the software on 2-5 workstations. You can also purchase the unlimited user license which will allow you to install the software on any number of workstations. If you have additional questions, email support@1099pro.com or call us at 888-776-1099. Can 1099 Pro print, mail, and file my forms? Yes, we have a Service Bureau for that specific purpose! Please see our Service Bureau web page on this site for more information. Can 1099 Pro process corrections? Every version of 1099 Pro can process corrections. Can I create a correction on a record that has already been corrected? Corporate Suite support corrections of already filed forms, and corrections of already filed corrections. By simply double clicking on your filed record, you can make additional adjustments. Additionally, 1099 Pro will automatically generate a "zeroed out" copy of all corrected originals if recipient names or TINs are changed. Can I export my data from another program into 1099 Pro? Data can be exported from almost every third party software in an Excel or delimited format. To do this, create an export in the software that contains all of your data that you wish to import into 1099 Pro. Include all of the necessary fields that would be reported to the IRS; name, address, tin, dollar amount, etc. Export to Excel, delimited, CSV, or TAB file which can then be mapped and imported into 1099 Pro. Does 1099 Pro offer any other software? 1099 Pro, Inc. develops and markets a comprehensive range of award winning, easy to use, yet powerful Windows software products designed to fulfill all 1099, W-2, and 1042-S filing requirements. How do I transfer my data and custom maps from a previous version of the software? During the installation wizard, you will be given the option to roll your previous import maps, as well as recipient and filer information into the new install. Note, the roll forward feature will not bring forward any of your financial data. Rather, it is intended to save you the trouble of reentering all of your recipient and filer contact information, as well as your security settings and transmitter information. How do I transfer my data from my old computer to my new computer? The following instructions will explain how to update your old computer's installation of 1099 Pro to the most recent version, backup your data, then restore that information on your new computer. If you are unsure how to complete any of these steps, please refer to Frequently Asked Questions for more information. Run an software update on your old computer to ensure your software is up-to-date. Once your update is complete, back up your data. When the software asks you if you want to overwrite the existing files, click on "Yes to All", and continue to complete the wizard. You information has now been transferred! 2. On your Windows desktop click "Start", "Programs", "1099 Pro 20XX" and "Check for 1099 Pro Updates". 3. After downloading any files click the "Finish" button. The Wise Installation Wizard opens automatically to install the update files. Visit host.1099pro.com to download updates, patches, or the most updated copy of 1099 Pro. How do I upload to the Service Bureau to print, mail, efile, or Bulk TIN match? Once you have imported your records, click on Via the Service Bureau under the 2nd step, "Printing & Mailing", located to the left of your screen. Click on the Printing & Mailing or E-Delivery Upload button located at the top of your screen to initiate a helpful Wizard that will guide you through the upload process. On the last screen, click on Finish to print your Control Totals report. Review an sign your report. Back in your software, highlight your pending upload, and click on the Complete Pending Upload option located at the bottom of the screen to send your upload to the Service Bureau. Fax/email your Control Totals and cover sheet to sb@1099pro.com to confirm that you are ready for the Service Bureau to print and mail your records! When you are ready to upload your records to the IRS or SSA, click on Electronic Filing under the 3rd step, "Filing My Forms", located to the left of your screen. Click on the Filing with the IRS Upload button located at the top of your screen to initiate a helpful Wizard that will guide you through the upload process. On the last screen, click on Finish to print your Control Totals report. Review an sign your report. Back in your software, highlight your pending upload, and click on the Complete Pending Upload option located at the bottom of the screen to send your upload to the Service Bureau. Fax/email your Control Totals and cover sheet to sb@1099pro.com to confirm that you are ready for the Service Bureau to electronically file your records! To run a Bulk TIN match using the Service Bureau, click on Via the Service Bureau under the 2nd step, "Printing & Mailing", located to the left of your screen. Click on the Bulk TIN Matching Upload button located at the top of your screen to initiate a helpful Wizard that will guide you through the upload process. On the last screen, click on Finish to print your Control Totals report. Review an sign your report. Back in your software, highlight your pending upload, and click on the Complete Pending Upload option located at the bottom of the screen to send your upload to the Service Bureau. Fax/email your Control Totals and cover sheet to sb@1099pro.com to confirm that you are ready for the Service Bureau to check your TINs! How do I view my rolled over recipient data? Open your software and click on the Recipients List option located near the bottom left of yhe screen. This Screen will list all of your recipient information. Also, while entering data manually into any form, press the F2 key or right-click in the Recipient Identification Number box. Where are the Data and Backup Data folders stored? If you open your software and go to Help and About in the menu bar, a screen will display with information about your software. Click on the 1099 Pro icon in the upper left corner, A screen display showing you where the software is installed. Your data is stored at the location displayed under Global Data Path. Order your 1099 Pro software the fast and easy way, online! Just click the Buy Now button next to the version of the software that you want and it will be added to your shopping cart. When ordering online, you can choose to immediately download your software or have it delivered right to your door. Order the traditional way, by phoning in your order. Our sales staff is ready and waiting to take your order. Print the order form, fill it out in its entirety and select the products you want to purchase. To avoid delays, be sure to add appropriate sales tax and shipping for your area.